Technical Features: Ester based Polyurethane duct reinforced with a TPU high adhesion coated coppered steel spiral. Totally smooth inside to ensure optimization of flow properties. Constant Wall thickness of 0,9mm through all the diameter range. Properties: Strong but light and flexible, it's suitable for heavy duty applications where a very good abrasion resistance is required. 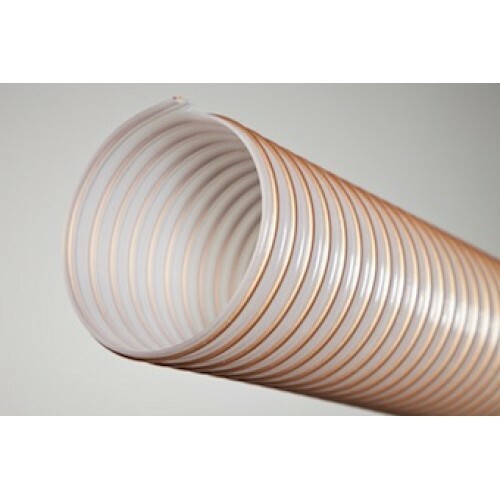 In fact its capability of abrasion resistance is 20 mm3, 50% more than a conventional TPU hose. Resistant to mineral oils, ageing, ozone, atmospherical agents* and to most chemicals. Halogens free conform to RoHS and phthalates free. Standards: Free of Halogen and Phthalates, with raw materials in accordance to REACH and conform to RoHS Regulations. The hose can be antistatic according to TRB S 2153 by grounding the spiral.